In the previous image we can see the cubemap texture represented in 3D. Notice that this image is the result of unfolding the first 3D cubemap representation. 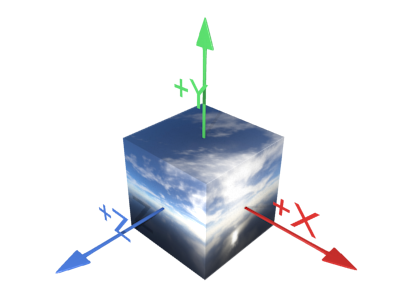 The textures expected by OpenGL are the images of the environment projected onto the faces of the cubemap as seen from the outside (I remark this because I’ve found myself trying to understand what was wrong because I uploaded the images as seen from within the cube, just because it seems kinda intuitive when implementing skyboxes). It actually does nothing. Although no vertices need to be processed, one vertex must be sent to the rendering pipeline (no matter its value or attributes) in order to launch the program. Finally, the fragments are coloured with the value retrieved from the cubemap sampler. In order to query the sampler, we use the interpolated position between the cube corners output from the geometry shader stage. As they are the corners of a cube centered at the origin (0,0,0), they perfectly match the directions to be used as 3D cubemap texture coordinates. 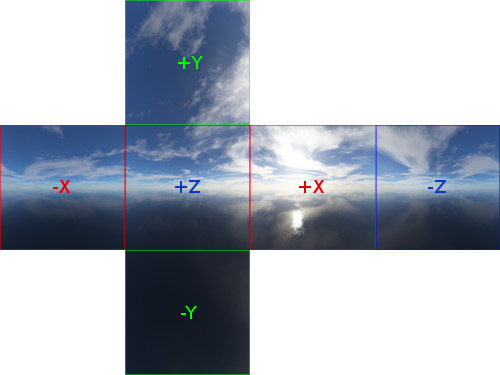 This entry was posted in GLSL, OpenGL, Programming and tagged cubemap, skybox. Bookmark the permalink.